An ensemble of sweet and zesty flavours combine to create this refreshing starter. Our recipe for Smooth Cheese with Pickled Apricots enjoys aromatic notes of mild spice along a base of smooth flavours from rich cheese. Adding bite and savour, pickled apricots provides a satisfying finish and soothes your palate. 1. Place apricots in a pan of water along with the sugar, orange juice, cinnamon stick, star anise and cardamom pods. Cook for approximately 15 minutes and let the mixture cool. 2. Cut 30 slices (about 16 oz) of Castello Aged Havarti. 3. 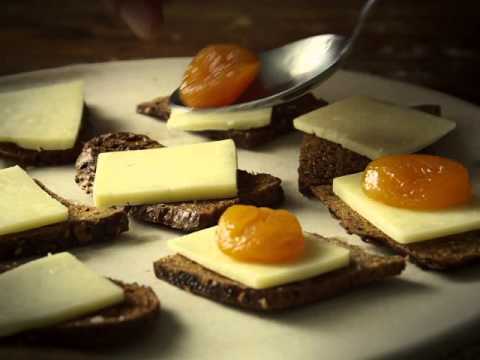 Top 30 mini-toasts or crackers with the Aged Havarti and apricots. 4. Drizzle a little of the syrup from the apricots on top and serve.